This week's challenge was a little late - in the run up to going on holiday, time disappeared. This time, the 'winner' of the random number generator was Lucy from Baking Queen 74. I love her recent recipe for pistachio and marzipan rolls. She's been trying to earn that hallowed position since the beginning of my cookbook challenge - persistence wins out. Jamie's Italy is one of the books I have made a few things from - I love Italian food and Oliver is probably my favourite celebrity chef - or at least my shelves seem to suggest that's the case. Now, the reason that it took a long time to actually get this one done is that it takes a long time to make. I needed an evening where I could spend the time sorting it out. 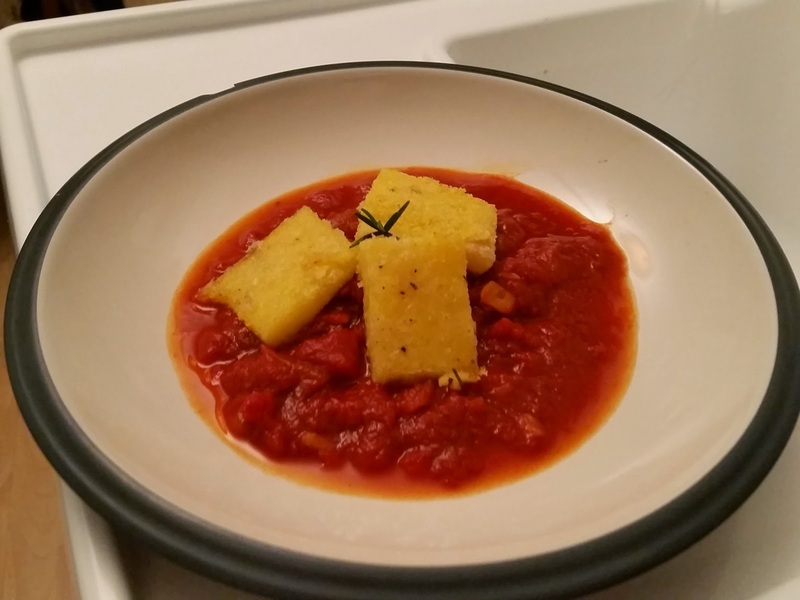 The polenta takes about an hour to cook and needs regular stirring. The night I made this was one where nothing really seemed to be going right. D has been going to sleep a lot later in the holidays and Roo has been finding the evenings a little more tricky since we came back from our holiday. She finds it a little difficult to get back into the routine when it's changed. I also think she's been finding it exhausting having D around all the time - I can't say I blame her. He's a whirlwind! I'd love to say that the recipe worked perfectly but it didn't really. 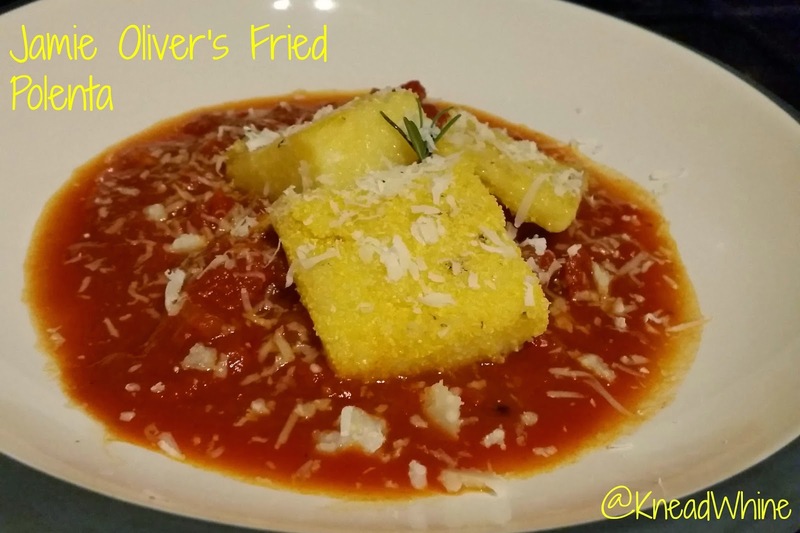 I chose not to deep fry the polenta as it's just not something I do. I tried shallow frying and it didn't work. I forgot to mix the parmesan into the mixture and instead sprinkled it over the top. 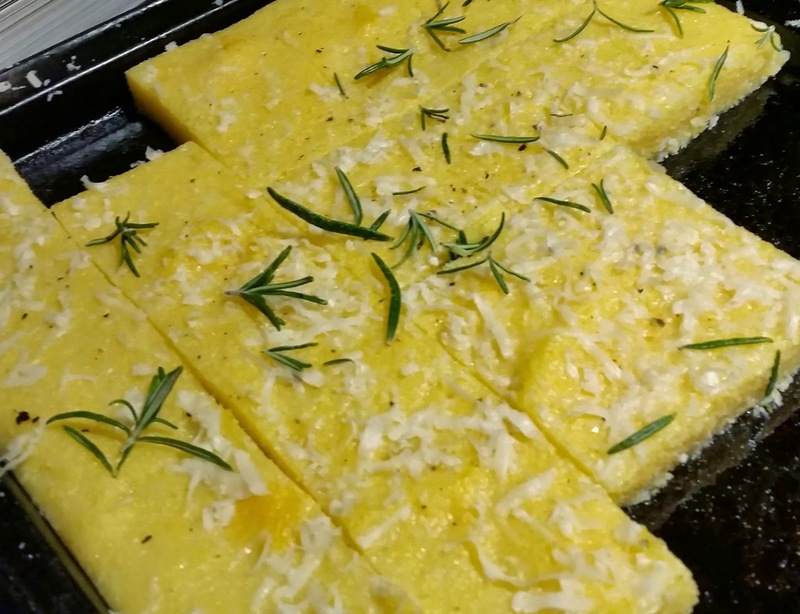 This made a bit of an odd crust that just came away in the frying pan and left the polenta a bit tasteless. Roo has eaten pretty much everything she's tried and even she was a bit disgusted with it. I served with a tomato sauce that I created myself. Nothing particularly special but it did help to flavour the polenta a bit more. For this sweat half an onion for six minutes until it goes translucent. Add a crushed garlic clove and a finely sliced red chilli and cook for a further two minutes. Add a tin of tomatoes, a tablespoon of tomato purée and half a tin of water and allow to simmer over a low heat for about an hour - this should leave you with a jammier, thicker sauce. Phew. I'm rather glad that the next cookbook challenge (that I still have to catch up with!) is for white baps. Almost seems far too easy. Next week's challenge is all chosen - Gate Gnocchi. I'll let you know when the next one is up. It'll be over on KneadWhine's Facebook page. Hoping to see you there!